Understanding the user behavior in a multi-device world is one of the most recent mobile marketing priority for any manager and organization to focus on in order to provide consumer oriented products or services. Google addresses this audience segmentation on a granular level by calling it Moments. Last year Google published and shared an infographic called 4 New Moments Every Marketer Should Know, categorizing the new trends on consumer search behavior through mobile phones. Mobile searches have bypassed desktop computer searches and these behavior continues to grow, so there is not surprised to see Google allocating a lot of resources to mobile initiatives like Page Speed Insights and issuing new guidelines to ensure mobile sites are loading quickly. 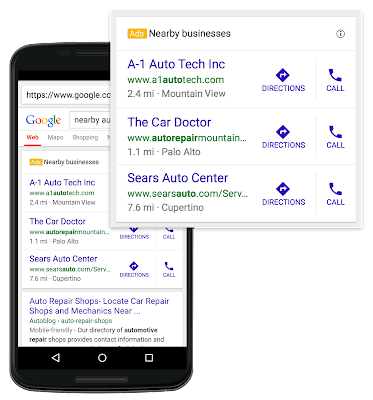 And to further improve user search experience Google introduced “Nearby Business” mobile ad format which connects mobile users on the go to local business with a click-to-call and directions. Any experienced marketer with a little knowledge of analytic tools like Google Analytics or SEMrush can recognize this type of mobile search trend by analyzing the data. Which means for many businesses, this information has been there and ready to be capitalized. Many analytic tools can determine the tremendous increase in the slope of the search volume and its trend focused on local business. The visibility of the search value that any business can generate should be tested to fine-tune and to figure out how actionable the user’s searches –where maps, call to actions like click-to-call or watching a video– can assist you in generating a killer mobile stradegy and a format what works for your client or business. Instead of drowning this page with graphs generated by these tools that you already know how to read, here is a list of some tools for you to play with. To search for long-tail keyword sources which can be key indicators of local searches like hours, location, prices, reviews, video product demo, and so on, keywordtool.io, hubillin, SimilarWeb, Sistrix are good sources. Online consumers’ moments have increased rapidly, 65% just in the last few years. Consumers who watch commercials on television continue to follow their brands on their mobile phones. The growth rate for local business searches done on mobile devices has doubled in just the past year. Since 82% of users consult their mobile phone while shopping at the store, stores like Target or Stop and Shop are quickly moving for fast implementation of new technology to keep up with this trend. The conversion rate for all of these searches went from very little to almost 30% within a year. Consumer are looking for information in micro moments, and thanks to the proliferation of mobile devices is it important for organizations to adapt to these micro-moments. Now, we all talk about the consumer or user journey funnel– from point A to point B –and obsess about data modeling, but in reality this is just wishful thinking in the part of the brand. The future for marketers is to focus on figuring out how to manage multiple mobile channels’ touch points , and how to build “experiences” that are valuable, and adapt each costumer behavior and interest to obtain a central view of your costumers. Historically organizations have kept this wealth source of databases separate for each channel–even when it is the same consumer— such as cookies for websites, IDs for mobile devices, wireless IDs for location, ad phone tracking IDS, email tracking URLs and so on. Marketers need to consolidate, track and link disparate user’s IDs to the right consumer, so we can determine the consumer’s micro-moment’s touch points to form a central view of the consumer in order to develop a program that peaks to the consumer at each moment in a relevant way. To learn more about moments download Google’s Free Complete Guide to Micro-Moments with strategies, insights, and customer examples for mastering micro-moments.